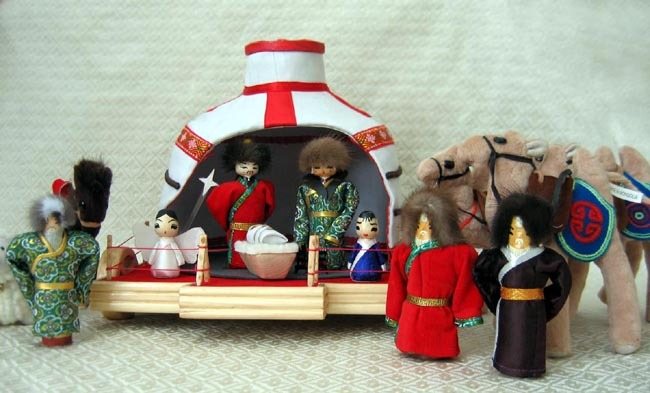 This Nativity set is handcrafted in Mongolia by Shuuraa. She made by hand all of the figures and animals, while her son crafted the wooden cart. The Holy Family resides in a ger—the traditional nomadic dwelling in Mongolia. Gers that Mongolians live in today are folded up and transported when the nomads move from place to place. But the ger in this scene is on a cart to designate royalty—only Genghis Khan had a ger on a cart. Mary’s costume reflects the traditional Mongolian woman’s costume, which is very bright and lavishly decorated. She wears a collar with her costume to denote that she is a married woman. The fur hats and the horse’s mane are marmot and beaver fur. A fire keeps baby Jesus warm from the -40 degree Fahrenheit winters in Mongolia. The set includes Mary, Joseph, baby Jesus in his manger, a fire, an angel with star, a shepherd boy, a horse, an enormous sheep, three camels, three wise men, and the ger on a wooden cart with wheels. The cart measures 12 inches by 12 inches and the ger stands 11 inches tall. The people are about 5 inches tall.